The exhibition in Hong Kong already took place in February. On March 22, all students from Helsinki, Hong Kong and Zurich will be present at the opening via video-conference. This exhibitions provide an insight into the project “Accidental Tourist Guide”, an intercultural artistic project of students from Zurich University of the Arts (ZHdK), Aalto University School of Arts, Design and Architecture Helsinki and Academy of Visual Arts, Hong Kong Baptist University (HKBU). The projects was developed before and during a one week period in Hong Kong, where the students with different cultural backgrounds have negotiated their inputs and interests in relation to the local communities in Hong Kong area. 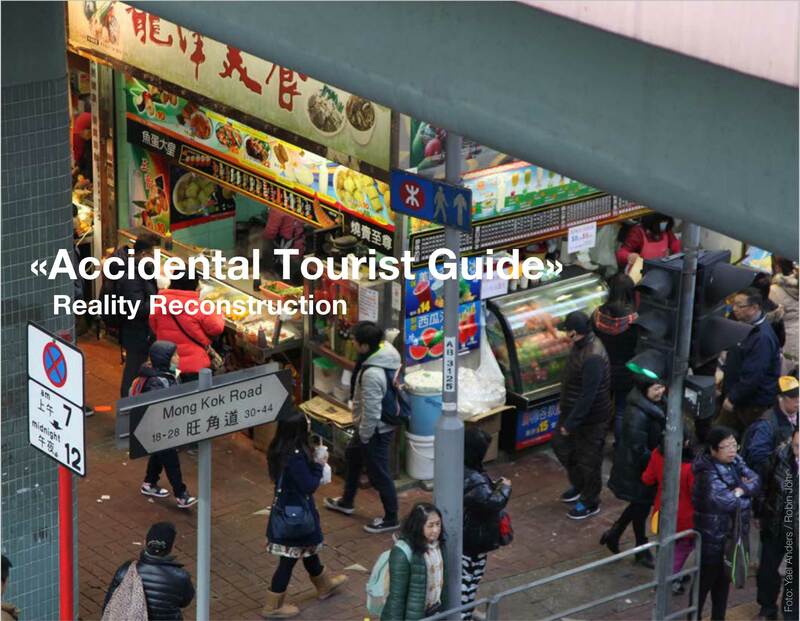 “Accidental Tourist Guide” is focused on self-awareness and self-reflection in a transcultural context, on discerning differences in aesthetic perception and practices, and understanding differences of intercultural development processes in the field of educational and design projects and formats. The project was divided in two phases. During the first phase (November ­ December 2016), the students from Zurich and Helsinki did research online about Hong Kong ­ mainly based on selected material researched by Google Street View ­ and developed their first ideas for a project work on site. Hong Kong, Helsinki and Zurich each. The groups exchanged thoughts about the further development of the project proposals online.The tools used were WhatsApp, e-mail and Skype. During the second phase the student teams acted in real space in Hong Kong. The first day the students from Helsinki and Zurich started the project week with their “Accidental Tourist Guide” for the students and teachers from the HKBU. For the next six days, they worked in groups on their individual art projects. At the end of the week the art projects were exhibited at the Connecting Spaces Hong Kong. In March 2017, the exhibition will be shown again simultaneously in Hong Kong, Helsinki and Zurich.